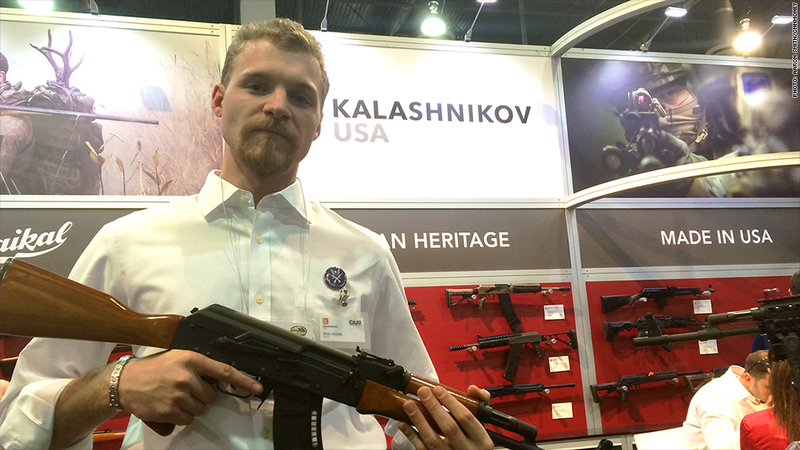 Rick Young, a salesman for Kalashnikov USA, poses with a classic AK-47 at the booth at the gun show in Las Vegas. An American gun company has found a way around the anti-Russia sanctions that have banned imports of the Kalashnikov assault rifle: Make them here, in the U.S.A. The U.S.-made gun will have same name as the original: AK-47, arguably the most ubiquitous assault rifle in the world. The gun will be made by American company RWC, which is the official importer and distributor of Kalashnikov AK-47s. The company had to stop importing the guns after the U.S. imposed sanctions in July against Russia for its role in the Ukraine crisis. RWC said it is not permitted to have any contact with the Russian company, Kalashnikov Concern, which makes the AK-47s. "We are not permitted to pick up the phone and to talk to them," said Thomas McCrossin, CEO of RWC, which owns the Kalashnikov USA brand. "We were forced to stop doing business with them because of the sanctions." RWC, based in Tullytown, Pa., has the rights to the AK-47 Kalashnikov brand of guns, which has been produced in the Soviet Union after World War II. It is arguably one of the most famous firearm brands in the world. The original AK-47s are made by the 200-year-old Russian company, but it is one of the most copied assault rifles in the world with knock-offs made all over the globe, including China, Europe and the U.S.
Demand for Ak-47s -- already very high in the U.S. -- has surged after the sanctions. For now, the company has enough guns to meet the demand. "I have a lot of inventory on my shelf bought and paid for," McCrossin told CNNMoney in Las Vegas at the annual gun industry show. "We are permitted to sell these weapons because they were already in the U.S. But when the inventory goes down to zero, there are no more." McCrossin plans to change that with a new factory that will make the first AK-47s in the U.S.
"In the second quarter of this year we are going to start manufacturing here in the U.S.," said McCrossin. "What I'm manufacturing are our own AK-47s and shotguns under the Kalashnikov brand." CNNMoney has reached out to Kalashnikov Concern in Moscow for comment, but hasn't heard back. McCrossin said he's shopping around for a location for the factory. He said that he plans to hire people, but he wouldn't say how many. He made the announcement at the Kalashnikov USA booth at the SHOT Show. The booth carried the slogans "Russian heritage" and "Made in USA."